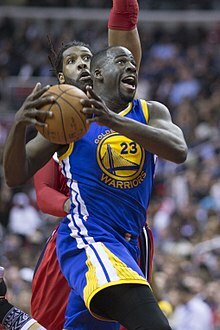 Draymond Jamal Green Sr. (born March 4, 1990 in Saginaw, Michigan) is an American basketball player. He plays for the Golden State Warriors of the National Basketball Association at the power forward position. Green has won NBA title thrice. He has also been declared NBA All-Star three times. This page was last changed on 22 November 2018, at 15:09.